Reflections on the time I got angry at Rabbi Meir Schuster zt”l, the man who helped bring hundreds and possibly thousands of unaffiliated Jews (including my husband) back to Judaism. your message has struck deep within. as a Baalas Tshuva, i have experienced the constant pull of my former life and my religious life. throw in a healthy dose of jewish guilt, and the road has not been easy. one of the best sayings of my youth is: Keep your eye on the ball. In living a Jewish Centered Life, success is only possible if you keep focused on the goal, the mission, the reason for life itself. your comments about Rabbi Schuster reinforce that message. If we are doing the right thing, then we must keep focused and feel confident in our derech. as it says in Shulchan Aruch, follow Halacha and ignore the scoffers. Wow. I was just looking around for other Jewish mom blogs and how funny that I would come to yours first and learn about Rabbi Schuster’s passing. I spent two years in Israel, and he also walked up to me at the wall. The first time I blew him off, but the second time, I took the invitation. He was a wonderful man. My journey led me more away from than towards orthodoxy, but as my family’s had a difficult time over the past few years, I’m more and more convinced that our immersion in the secular world is partly to blame. I’m craving those Shabbats in Jerusalem, and trying constantly to explain, and increasingly to show, my husband and family that Shabbat is the most amazing gift we have as Jews. It’s a lot harder here. I wish my husband could’ve experienced the Shabbat dinners in the Old City that Rabbi Meir gave me, the family’s he introduced me to. I have a lot of ongoing struggles with much of what I experienced, but the release of Shabbat isn’t one of them. 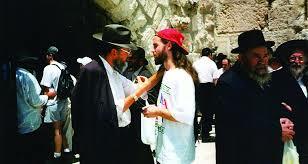 Rabbi Meir’s memory certainly is for a blessing. I am grateful he had the strength, the ability, and the commitment to just keep on asking, even when the young people he approached weren’t in the right place themselves to hear him.